Are you getting married soon, or do you know someone who is? Have you given any thought at all to your wedding party gifts? Traditionally, you would offer a special gift to your bridesmaids and groomsmen. You can include your ring bearer and flower girl in this gift list, too. If you are having a relatively large wedding and your wedding party has several people in it, this can get a bit expensive. So what do you do? You choose the perfect DIY wedding party gifts, of course, and I have just the list to help you. I found 35 unique DIY wedding party gifts that everyone in your wedding is sure to love. Now, these aren’t gifts for your guests. These are super special gifts that you give out to the people who are standing up with you at your wedding. They are all really easy to make and many of them can be completed in an afternoon. That means you just need one afternoon to take care of all of the gifts for your bridesmaids and groomsmen and trust me, DIYing these gifts is a lot less expensive than buying them. Plus, DIY gifts are much more special. 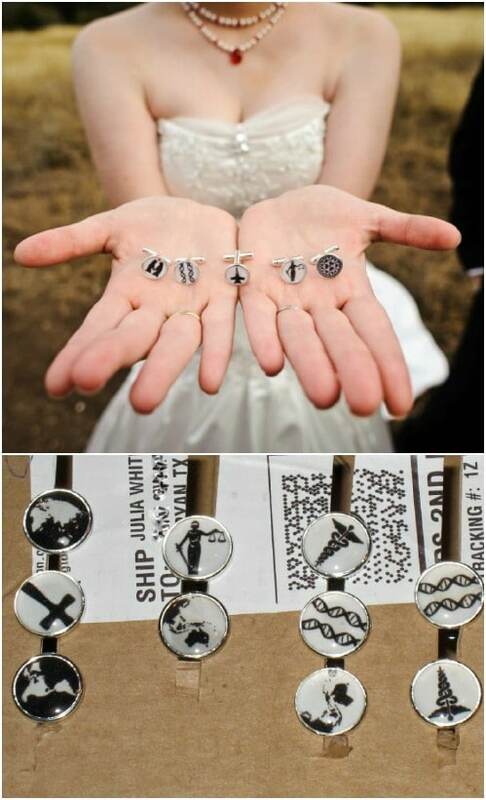 If you are planning a DIY wedding, you definitely want to check these out. Plus, you may be interested in these 40 frugal DIY wedding favors to hand out to your guests after the ceremony. We do a lot of weddings in my family – there are just so many people! So we always look for ways of DIYing the things that we need. I love making my own gifts so these DIY wedding party gifts are just perfect. 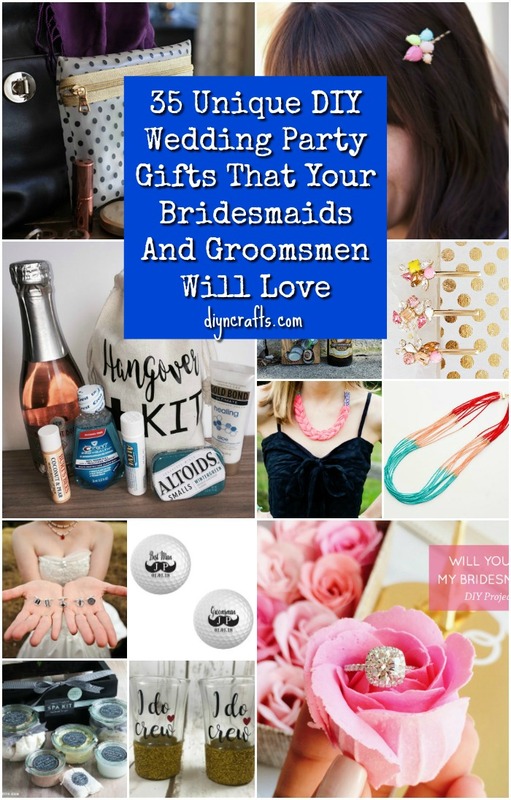 There are gifts in here for men and women so you can make something for all of your wedding party. And, if you are planning to DIY your entire wedding, be sure that you check out my list of 35 breathtaking DIY wedding decorations for the ceremony and the reception. 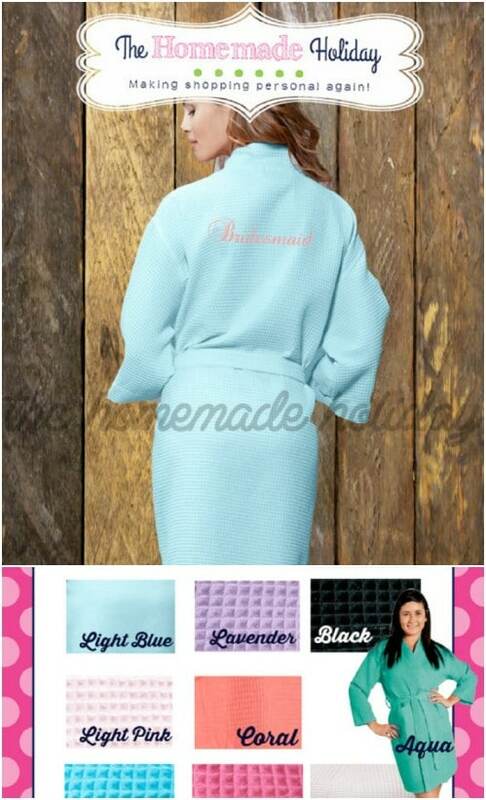 This personalized robe for your bridesmaids is an excellent wedding party gift, particularly if you are having a destination wedding or just staying together the night before the wedding. You can purchase inexpensive spa robes and then just embroidery the personalization on them. Or, just take a look at these lovely versions on Etsy. They’re under $30 each and come in a wide selection of colors and monogram styles. 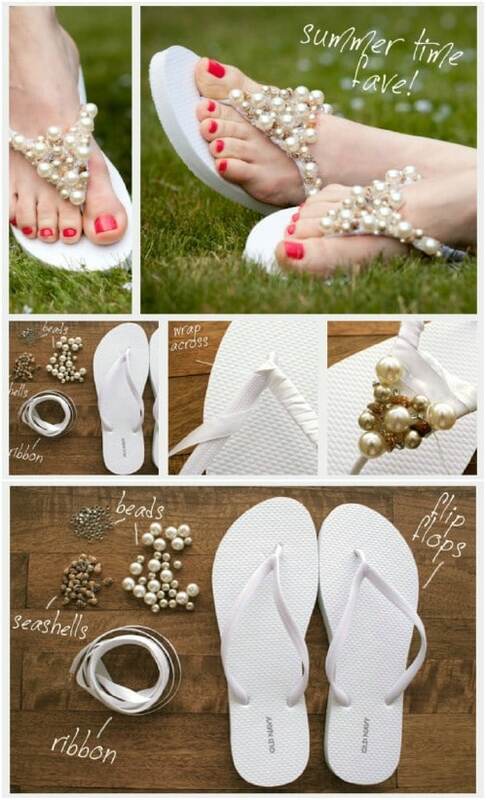 I love the idea of giving beaded flip flops to bridesmaids as their wedding party gift. This is a particularly good idea if your wedding attire allows these to be worn during the ceremony. You can make your bridesmaids’ shoes and then as a gift, they can keep them when the wedding is over. You only need a cheap $1 pair of flip flops from the Dollar Store or Dollar Tree and a few inexpensive embellishments to make these. And who wouldn’t love a pair of DIY flip flops? If you want to give the gift of jewelry, this DIY beaded statement necklace is an excellent choice. You can make one of these for just a couple of dollars and your bridesmaids are going to love them. 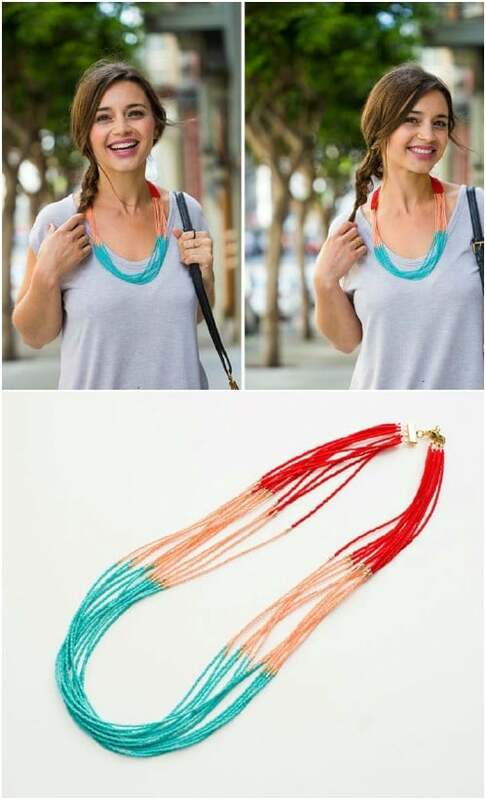 If you need jewelry for the wedding, you could do these in the colors that match your bridesmaids’ dresses and then just let them keep their necklaces when the wedding is over. 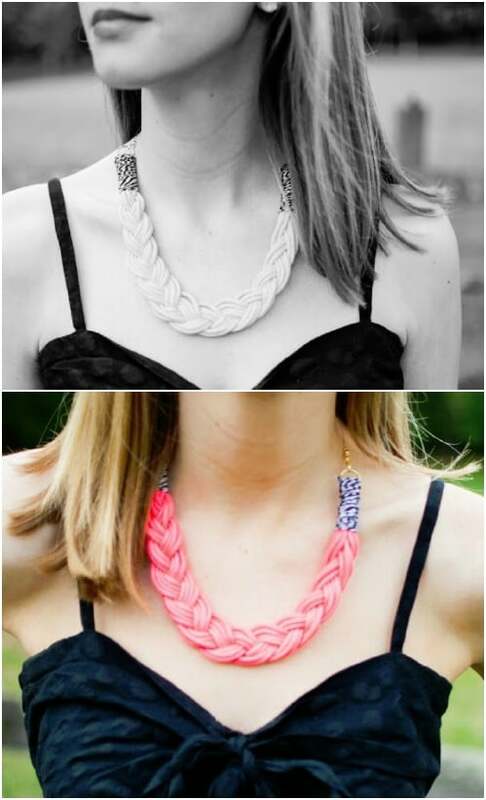 If you really want to give the gift of jewelry to your wedding party, these DIY braided necklaces are perfect. They are super easy to make and you can do them in any number of colors or combination of colors so you can match the colors of your wedding if you want. These could also be made for your junior bridesmaids and flower girls and they will adore wearing them after the ceremony. You can personalize any number of things pretty quickly and easily. 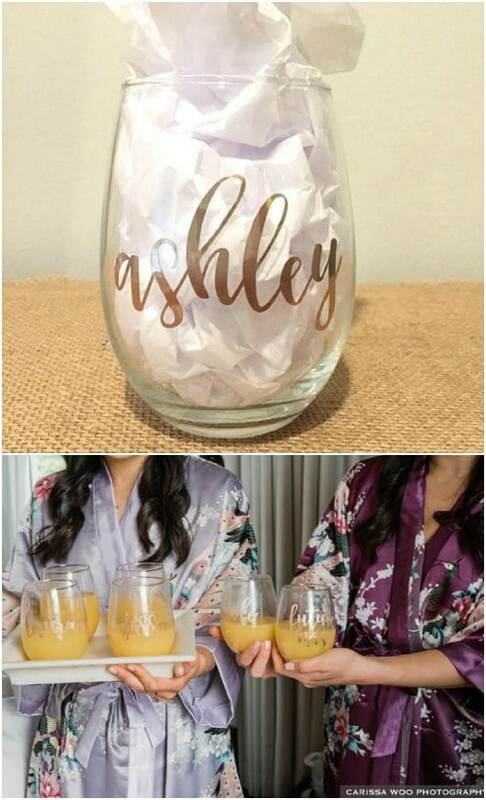 If you are searching for the perfect DIY gift for your wedding party, these personalized wine glasses are a great choice. You can make these with inexpensive glasses and printable decals or you could even paint on the personalization or use glittery sharpie pens. You could also check out these lovely ones on Etsy that I found for just around $10 each. Give the groomsmen in your wedding party a gift that they can wear for the wedding and for any occasion after with these DIY resin cuff links. You can find cuff link blanks online or at any craft or hobby store. Then, you just create the design that you want with craft resin and put them all together. 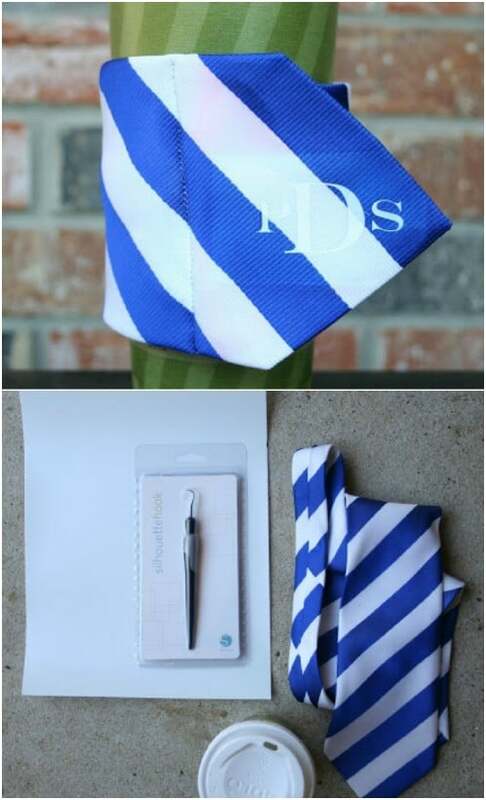 These are so simple and are such an elegant and thoughtful gift for all of the men in your wedding party. 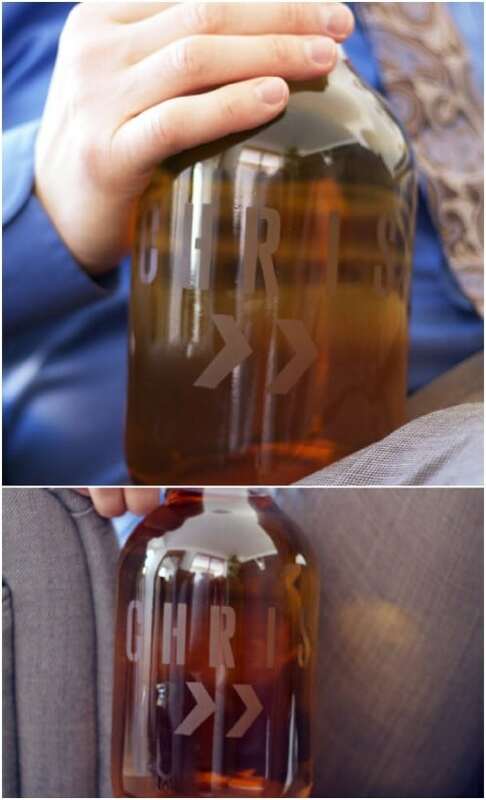 Here is another wonderful DIY gift idea for your groomsmen, father of the bride or any man in your wedding party. 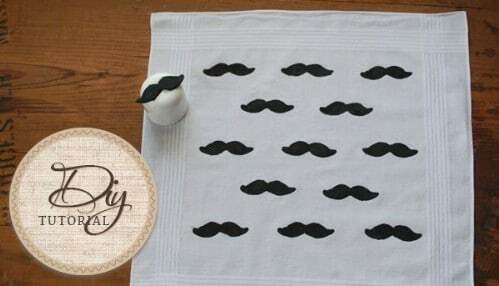 These DIY stamped mustache handkerchiefs are so whimsical and fun and they make a very practical gift. You just need some plain white handkerchiefs to make these, which you can pick up at any Dollar Store or Dollar Tree. Then, you just stamp them with a mustache stamp that you make yourself and you’re all done. 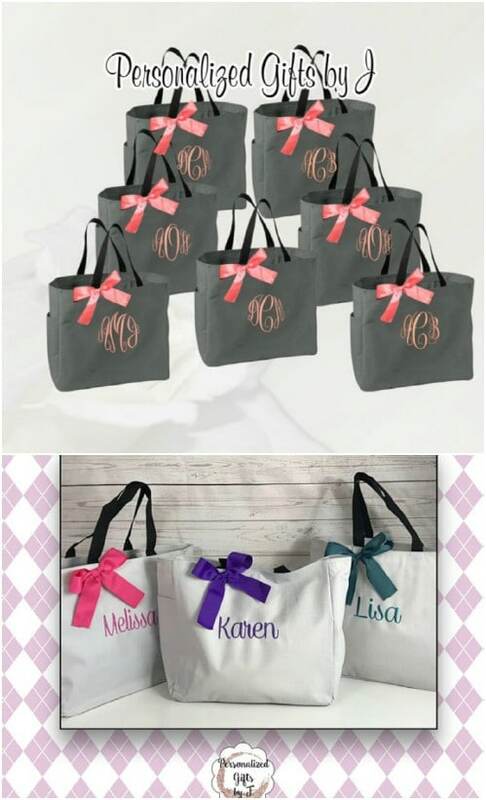 A personalized tote is a wonderful gift for your bridesmaids and these are so simple to make. You can find plain canvas totes at Hobby Lobby or other craft stores. Then you just personalize them with the names of your wedding party by embroidering or even painting on the names. You could also use sharpies to print their names if you prefer and even make DIY tote bags to personalize. Or, just check out these wonderful ones that I found on Etsy. They’re just $9 each and come in a wide range of colors. Rose petal infused honey is not only a pretty gift, it’s also a delicious one. This one would work for all of your wedding party, men and women, and it’s super easy to make. You can find local honey from your local farmer’s market if you don’t know someone who sells it and then you just infuse it with rose petals and gift it in a lovely jar. This is so simple and homemade infused honey is a gift that everyone will love. 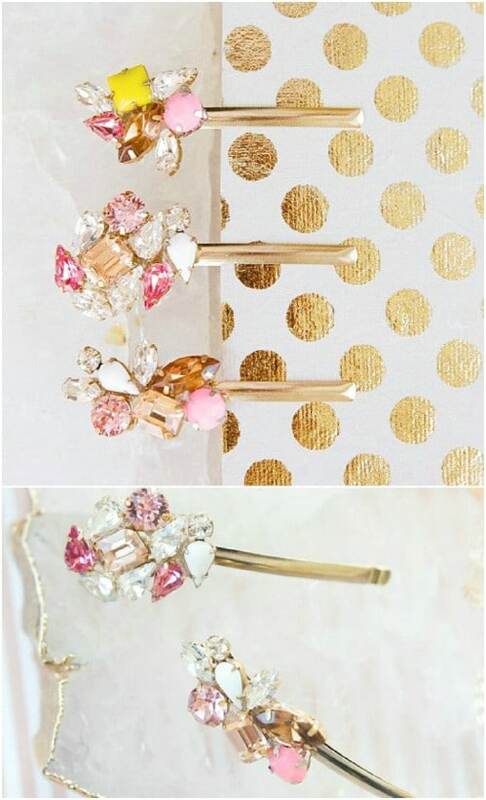 DIY gemstone bobby pins are such a wonderful gift for all of the ladies in your wedding party. You could do these to match your wedding colors and have everyone wear them during the ceremony. Afterwards they can take them home. Or, just do them in the favorite colors of each of your wedding party and then wrap them up in a pretty bag or box. They’re super easy to make and really cheap, too. 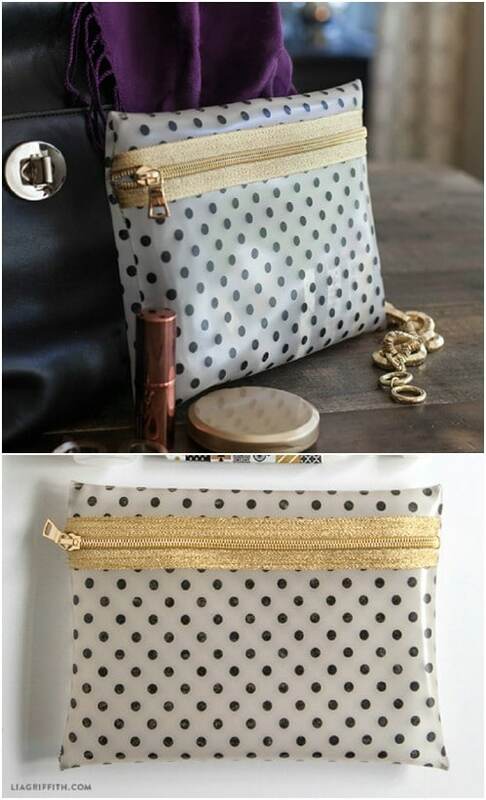 Your bridesmaids, and any lady in your wedding party, will love this DIY zippered makeup bag. It’s super easy to make and such a practical gift. After all, what woman doesn’t always need extra space for her makeup? Plus, these would be great for your bridesmaids’ wedding makeup. Give it to them ahead of the wedding and let them use their new bags to carry their makeup to your venue. 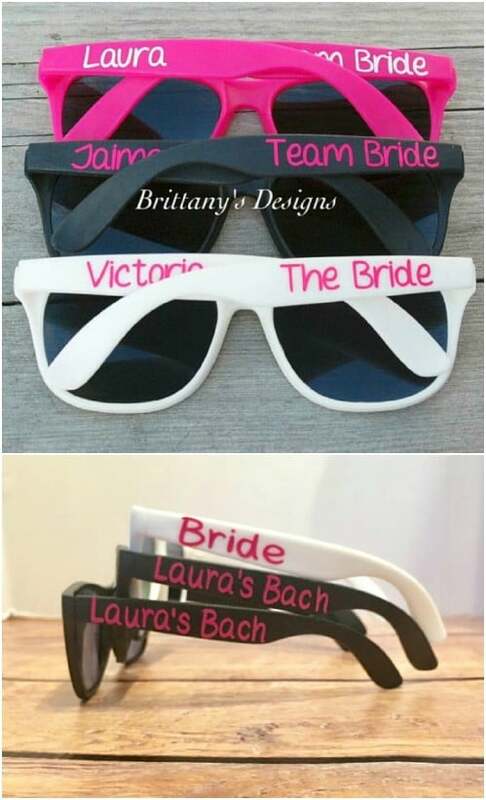 I love the idea of giving these cute little sunglasses as wedding party gifts. These are perfect for men and women alike and are a great gift idea if you want something simple and fun. You just need plastic sunglasses and some paint or colored sharpies to make these. Just put in the name of each of your wedding party and you’re all done. Or, check out this bulk package that you can get on Etsy. You get 18 pairs of personalized sunglasses and you have a few different color choices. Here is a wonderful gift idea – DIY candles! 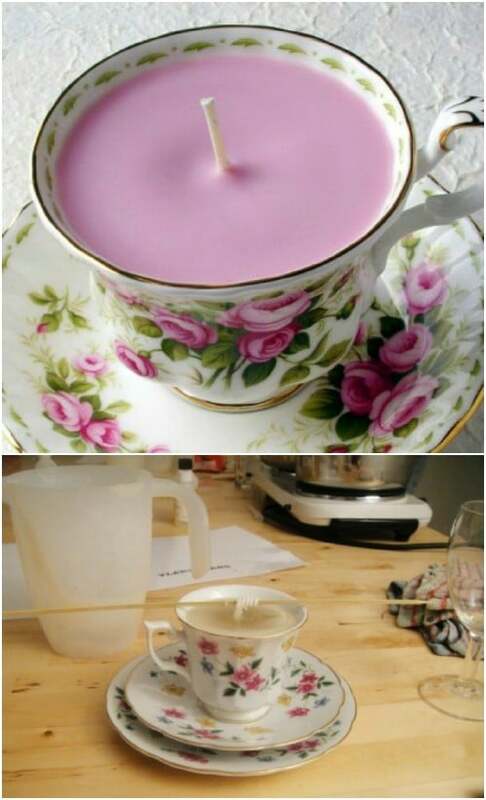 You can make the most gorgeous little candles from old teacups. This gives you wonderful gifts for your wedding party and gives you some great upcycling ideas for broken teacups. 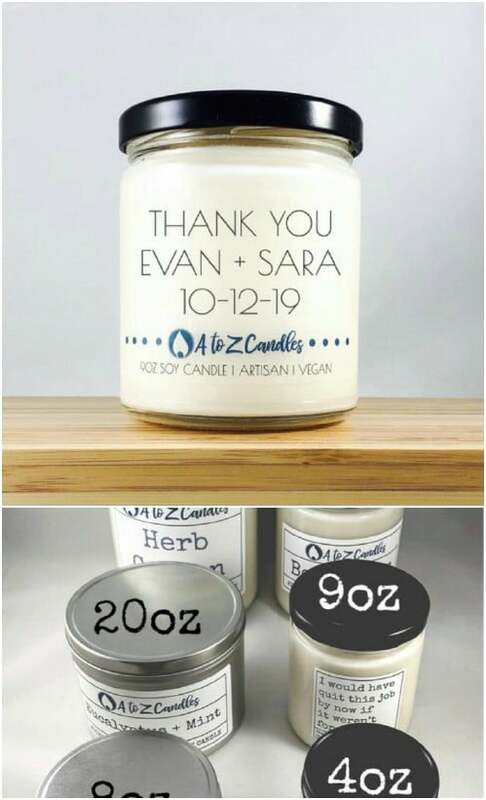 These won’t take long at all to do and since you do candles in batches, you can do one for each member of your wedding party all at once. You can have them all finished in less than an hour! 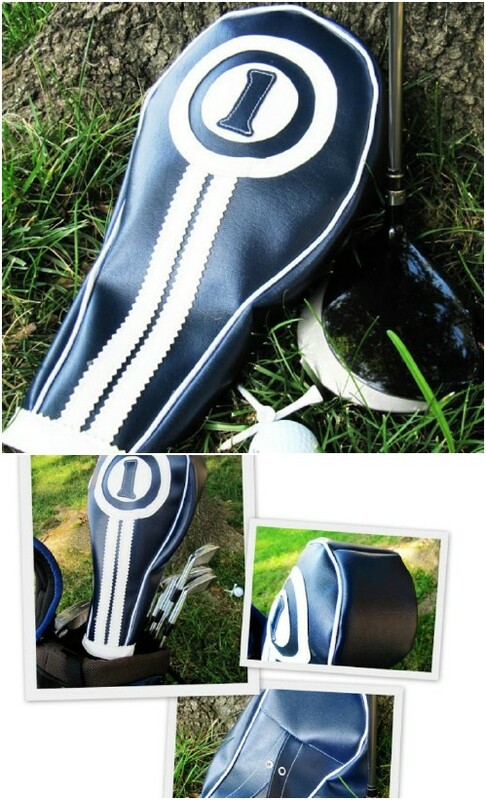 The men in your wedding party are going to love these hand sewn retro golf club covers. These are pretty easy to make, and don’t take up too much time for each one so you should have plenty of time to make one for each of your groomsmen, as well as the fathers of the bride and groom. You could even do an entire set for each groomsman if you have a couple of months, and maybe a small wedding party. 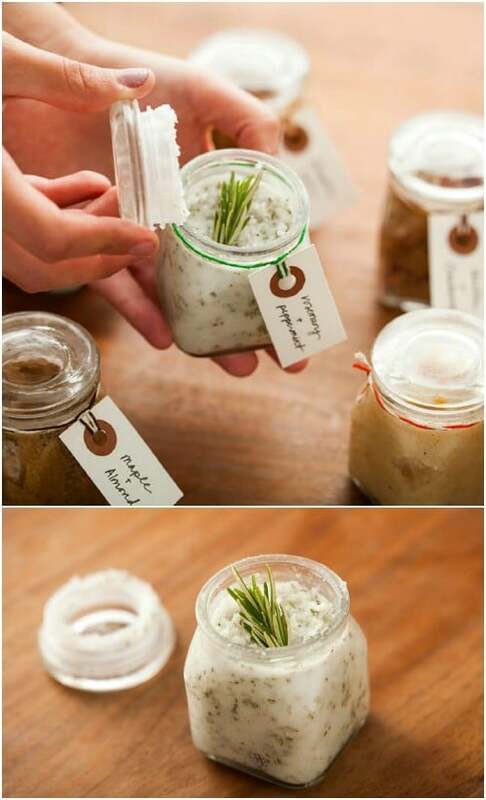 Here is a wonderful DIY gift for your bridesmaids. 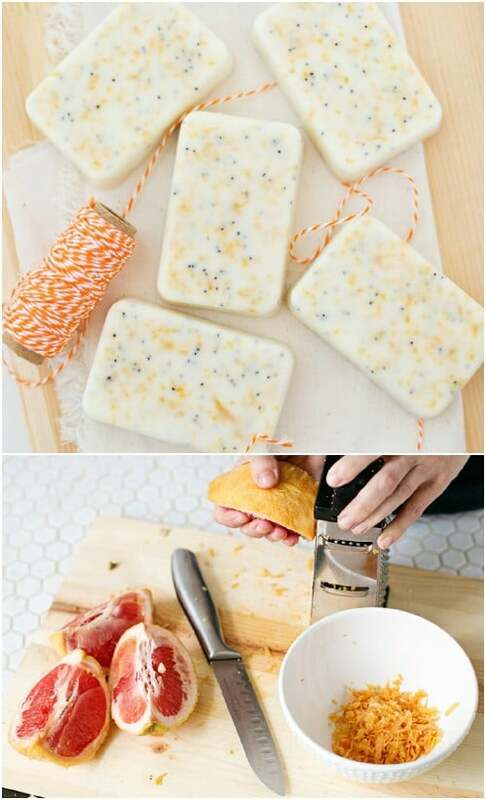 These handmade grapefruit and mint soap bars smell wonderful and they are pretty to look at, too. They are also super easy to make and only take a handful of ingredients. You can use a premade goat’s milk soap base for these to make them even easier. Then you just add in grapefruit, poppy seeds and grapefruit and mint essential oils. 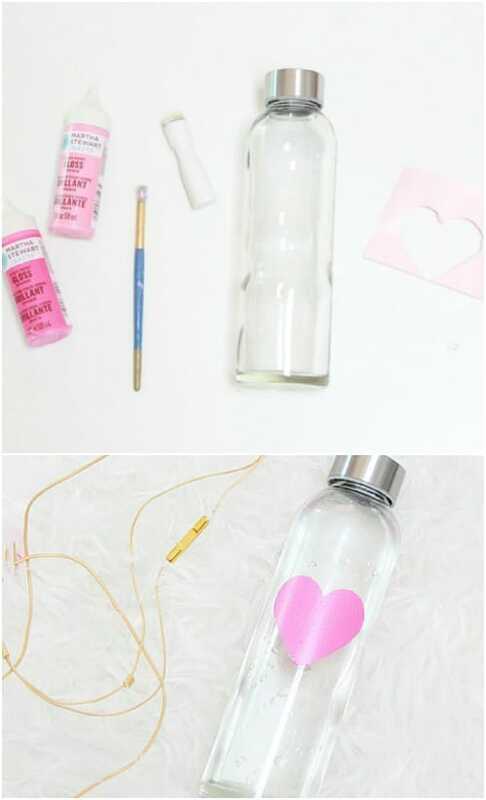 Make your wedding party a gift that keeps on giving with these DIY heart water bottles. These are super simple to make. In fact, you can do one for everyone in your wedding party in just a couple of hours. You can buy plain glass water bottles online, or at most department stores and some Dollar Stores. Then you just add your design and you could even personalize them with the names of your wedding party if you want to add a little something extra. How about a gift for him that he will treasure forever? This magnetic wooden bottle opener is perfect for a man cave. Each of your groomsmen can receive their very own bottle opener, complete with personalization. You can make these rustic beauties with just a plank of wood for each and an old bottle opener – check your local thrift stores for these. They’re really cheap. Or, you can take a look at the ones that I found on Etsy for under $25 each. Here is another wonderful gift for your groomsmen. Or, you could give this to your bridesmaids, too if they tend to love leather shoes, boots or jackets. 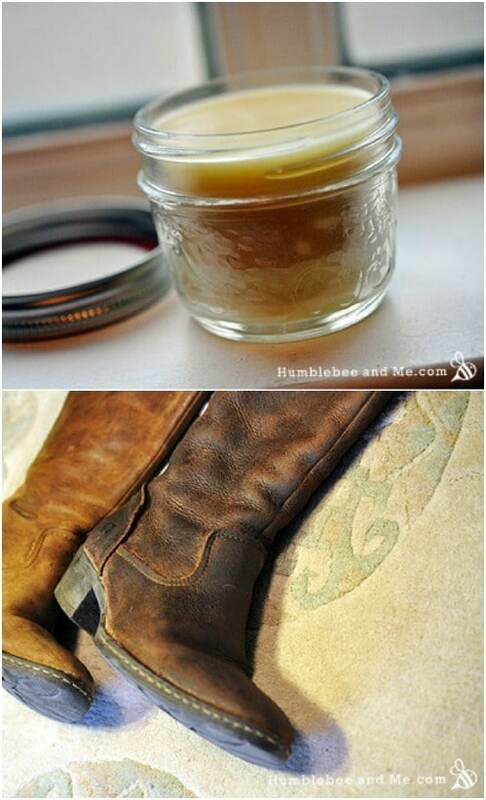 This homemade leather balm is super easy to make and works wonderfully to keep leather looking new. You just need beeswax, coconut oil and sweet almond oil to make this – and you can get most of those ingredients at the Dollar Store! This is a really cheap and really simple gift that all of your wedding party will love. I love this little coffee cuff that you can make from an old necktie. I really adore projects that let me upcycle old neckties and this one…well, it’s just awesome. You can create one of these little monogrammed necktie coffee cuffs in less than an hour, and if you don’t have some old ties to use to make these for your groomsmen, check out your local thrift store. They often have them for less than a dollar each. A flask is quite a traditional gift for the men in your wedding party. That said, this no sew wool and leather flask sleeve is super easy to make and it’s absolutely stunning when it is finished. You will need to buy a plain metal flask and then you fit the sleeve around it. You can find metal flasks really cheap – check the Dollar Store and other discount places. 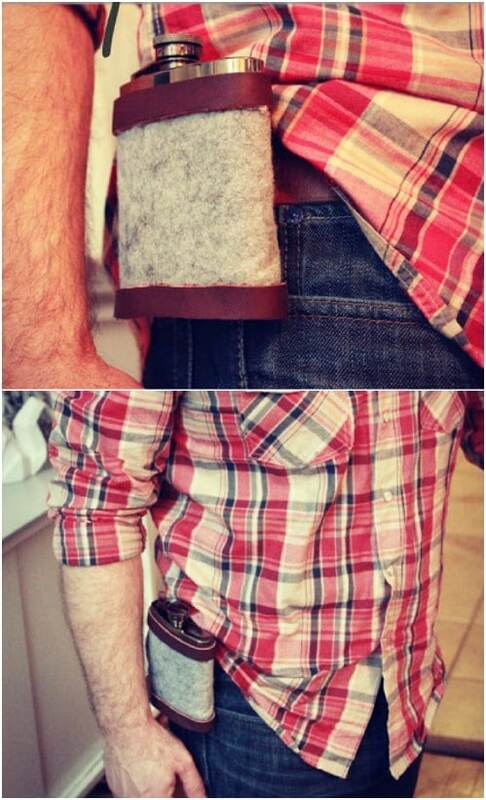 Then you just build the sleeve around your flask and the whole thing takes less than an hour for each flask sleeve. 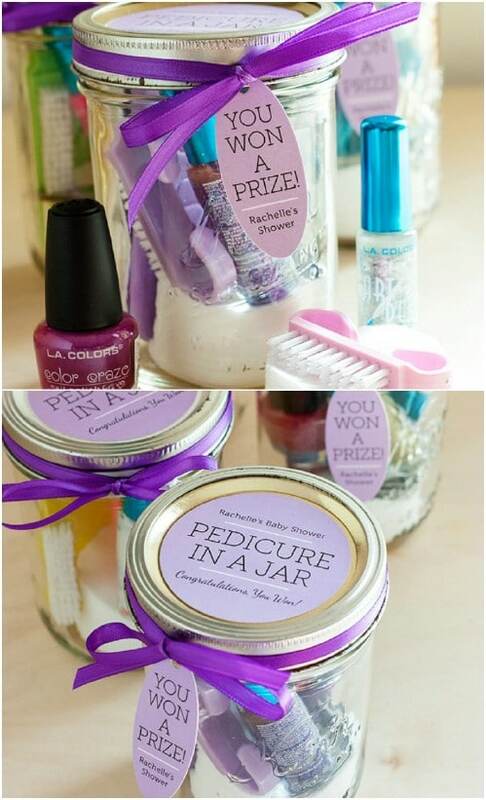 Your bridesmaids are going to love receiving this pedicure in a jar as their wedding party gift. And, you are going to love how simple and inexpensive these gifts are to make. You just need a wide mouth jelly sized jar for each one and then the things that you put inside. Head out to the Dollar Tree or Dollar Store and pick up some inexpensive nail polishes, brushes, nail files or anything else that you can think of and put them all inside. They can get their feet summer ready with their DIY spa pedicure. 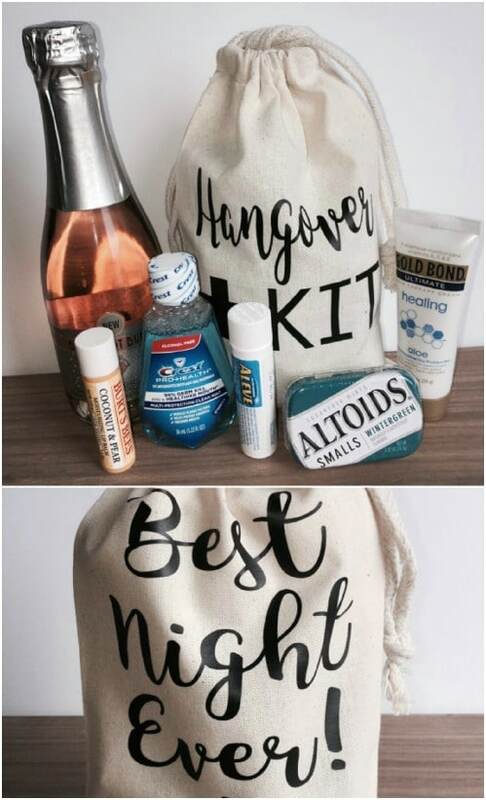 If you want a really funny gift for your wedding party, and one that will work for your groomsmen and your bridesmaids, this hangover kit in a bag is great. You just take small bags and fill them with things like toothpaste, mouthwash, aspirin and anything else that you can think of that you would need to cure a hangover. I found these on Etsy and they are around $4 per bag – you just have to fill them up. 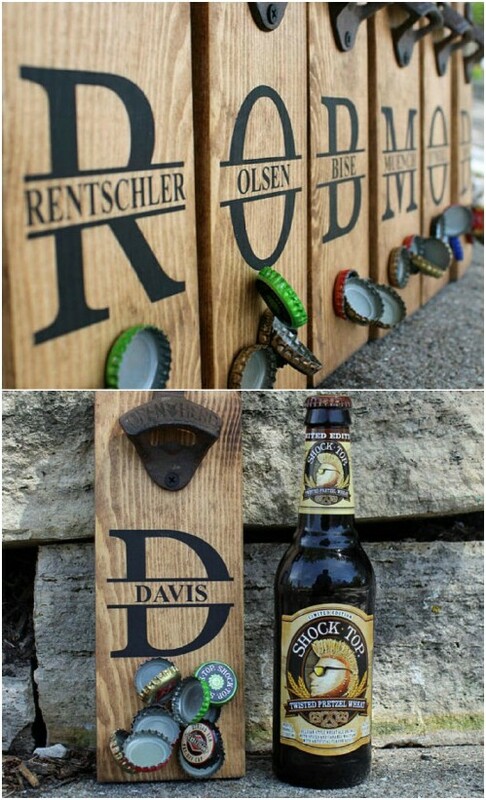 The men (and maybe even the women) in your wedding party are going to adore these DIY personalized beer growlers. These are such fun gifts and they are really easy for you to make. You can do one for everyone in your wedding party in just an afternoon. You will need to pick up a few half gallon beer growlers , which you can find online or in several department stores. Then, you need stencils, pattern tape and glass etching supplies to personalize them. Gift your groomsmen with this amazing DIY body scrub for men. This is a really simple scrub to make and it leaves skin feeling refreshed and smelling wonderful. You make it with a number of essential oils, as well as sugar, Epsom salt and coconut oil. Make up a batch and divide it out into small lidded containers for a wonderful groomsmen gift that they are going to love. 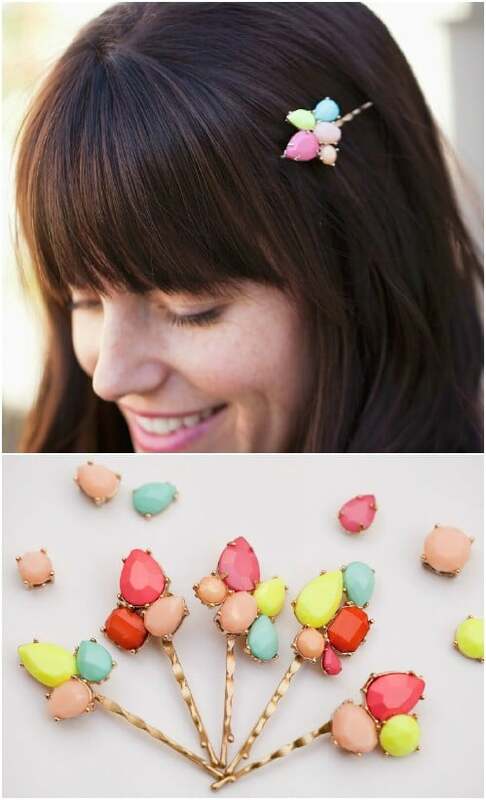 You can make these gorgeous DIY rhinestone hair clips with bobby pins or with hair barrettes or combs. Just choose your base and then add your rhinestones. You can get all of the supplies for these at your local Michaels or Hobby Lobby or check the Dollar Store for hair barrette or bobby pins that you can use. These are super simple and so beautiful when they are finished. These glittery shot glasses are almost too cute. They are perfect for your “I Do Crew” and super easy to make. You can find glass shot glasses at the Dollar Store and at most hobby stores. Then you just add the personalization and glitter and you’re all done. 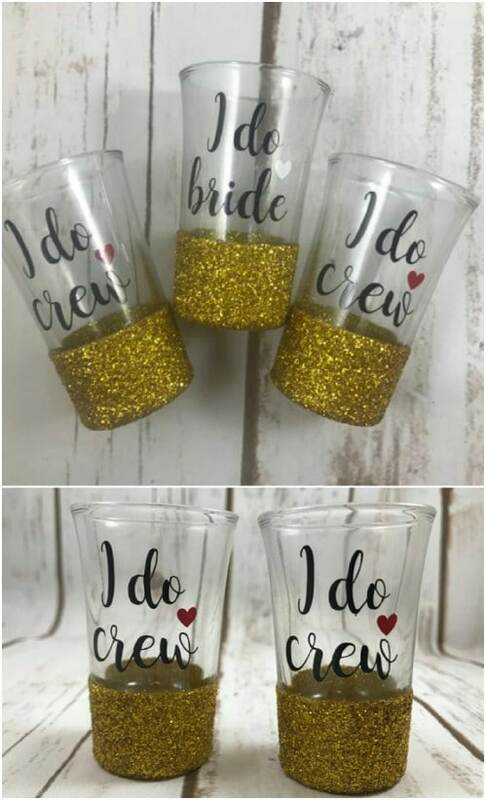 I found these on Etsy and they are just around $6 each and you have the option of having them personalized with the names of your wedding party if you want. 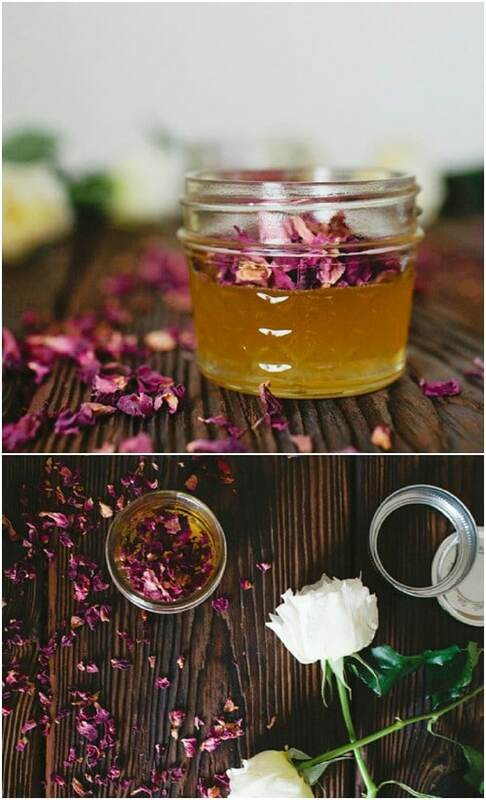 The ladies in your wedding party are sure to love these homemade rose petal bath salts. You are going to love them too, because they are super easy to make. And, the ingredients are pretty inexpensive so there’s that, too. 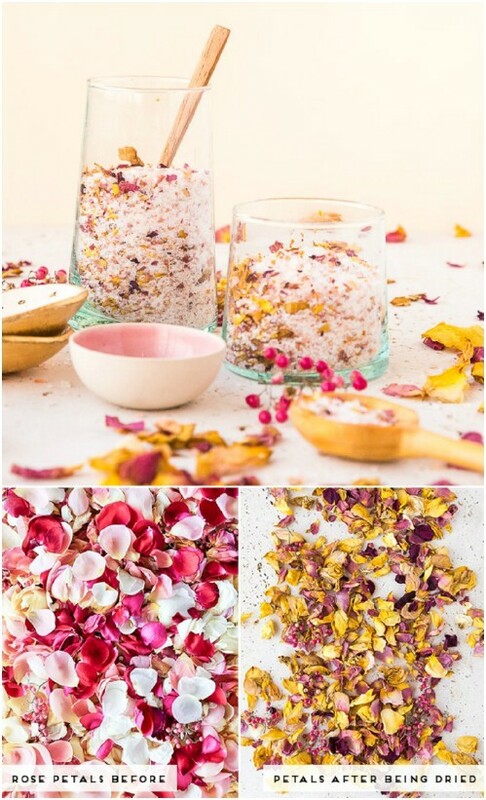 You just need some jars with tight fitting lids and then Epsom salts, rose petals, rose water, powdered milk and a few other ingredients to make these. They smell amazing and homemade bath salts are the perfect gift for your bridesmaids. 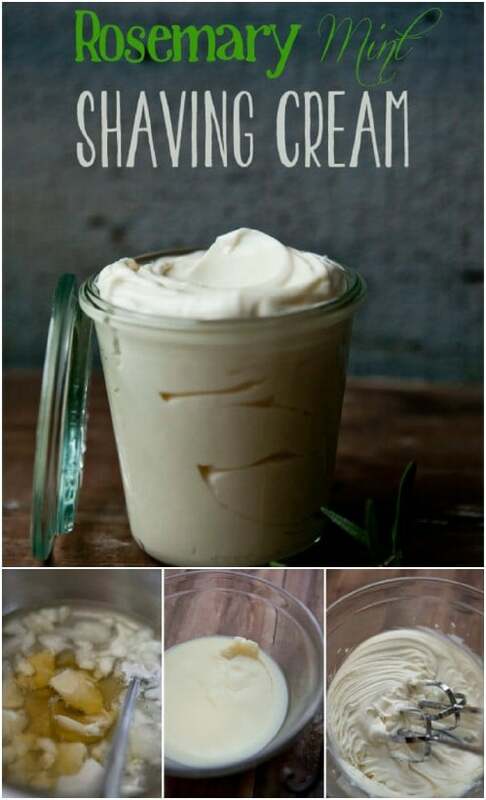 Okay, so this homemade shaving cream could be for men or women. After all, we women love moisturizing creams for shaving our legs, right? You make this one with rosemary and mint and it smells amazing. It’s great for sensitive skin, too. You could put these into bags or baskets with a little razor and some aftershave for men or moisturizing lotion for ladies. 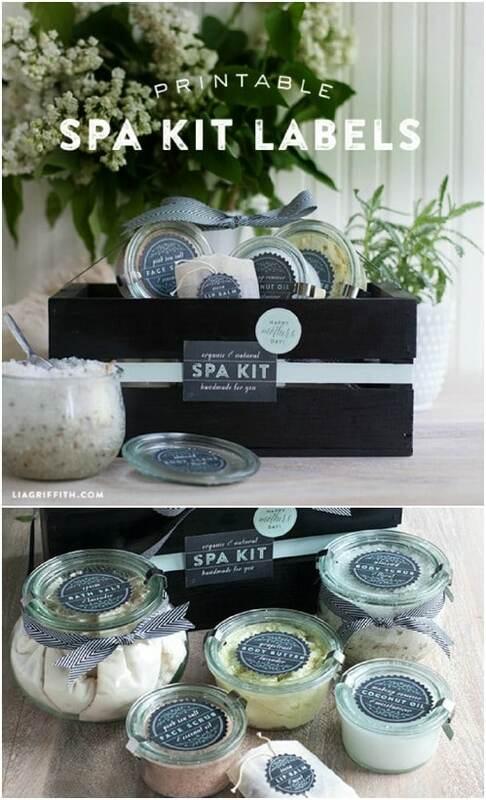 Give your bridesmaids and other women in your wedding party the gift of a spa at home with this DIY spa kit. These are super easy to make and you can decide what you do and do not want to include. You make up all of the spa products yourself so this one will probably take you a few hours, depending on how many spa products you want to include and how many batches of each that you need to make. This homemade sugar lip scrub is perfect for your bridesmaids and flower girls. It’s also super easy to make – and you’ll want to make one for yourself, too! You can make your own DIY sugar lip scrub in a couple of different ways and you can choose the flavors or scents that you want each of them to have. You could even personalize each one to the gift recipient to make them a bit extra special. You can easily make jar candles for all of your wedding party, and even your guests if you are looking for easy DIY wedding favors. Candles can be made in large batches so you don’t need a lot of time to do these. You can even print out the messages that you want to display and personalize each one for each wedding party member. Or, just head over the Etsy to see these that I found. They’re personalized and come in a variety of scents and sizes. 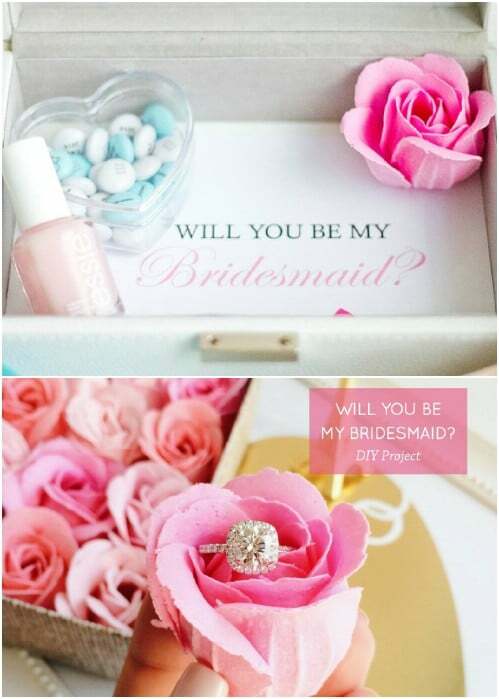 I love the idea of giving your bridesmaids gifts that they can wear for the wedding ceremony. 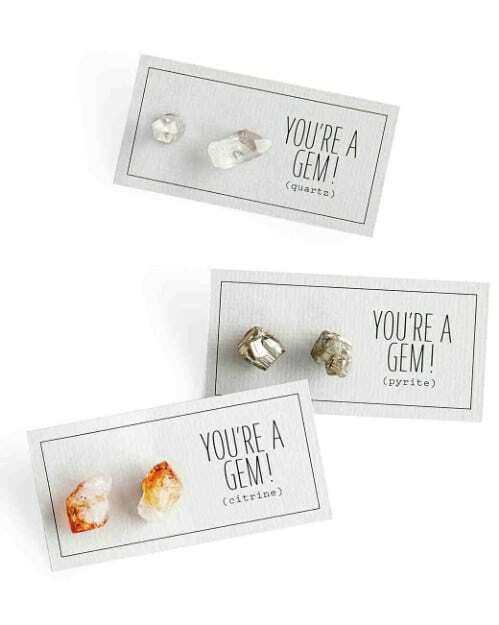 These DIY gemstone earrings are perfect for wearing to the wedding and anytime afterwards. You will find them super easy to make, too and you can do them all in one color or gemstone style or do a different gemstone for each of the ladies in your wedding party. 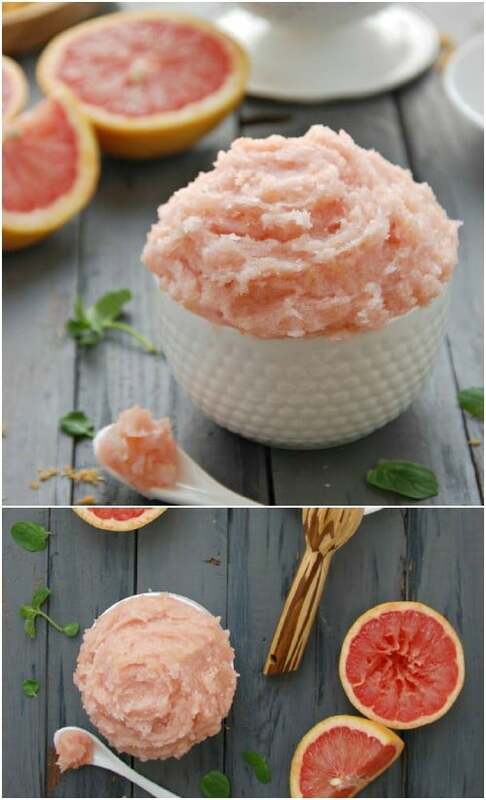 The gift of relaxation and beauty is perfect for your bridesmaids, which is why they will all adore this DIY whipped grapefruit sugar scrub. You make this with grapefruit and mint essential oils, as well as coconut oil, sugar and a few other essential ingredients. It is a beautiful color and smells so amazing when it’s finished. Make a huge batch of this and then just divide it into tightly lidded jars to give as gifts. Don’t you just love learning alternative uses for sugar and other household products? 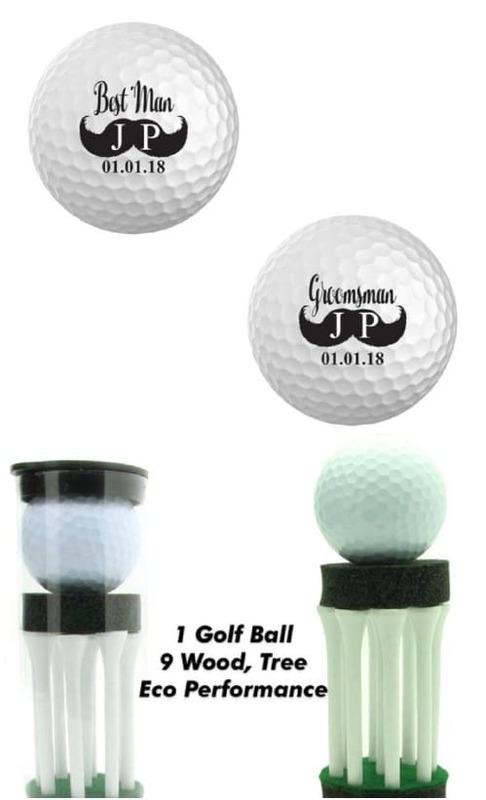 The groomsmen in your wedding party are going to love these personalized golf balls. Whether or not they play golf avidly, these are still special gifts that they are sure to adore. You can easily personalize your own golf balls buy purchasing a few inexpensive golf balls and painting on your personalization with a sharpie. Or, check out the ones that I found on Etsy. You get a set of three, customized with the name, wedding party position and date on them. Give each of your bridesmaids a wonderful gift that they will keep forever with these DIY personalized jewelry boxes. These are great for asking your bridesmaids to be in the wedding, or you can make them to gift at the wedding. Just choose your personalization and then get to work making these adorable little boxes, which are super easy to do.